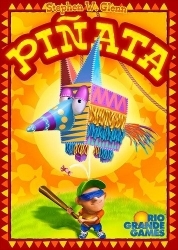 Pinata is a two-player card game in which players compete to collect the colored candy that is inside the pinata. Playing pieces that might otherwise be "cubes" are instead wooden markers with a bow-tie shape that mimics the shape of wrapped candies, coming in 5 different colors. When a player has collected enough candy of a given color, he earns the medal card for that color. The first player to earn 3 medal cards is the winner! The players play their cards next to several mats on the table. Players usually play their cards on their side of the mats, but they may sometimes play on their opponent's side, a move that can ruin their opponent's plans. This is a reprint of the popular game: Balloon Cup, but with the original theme from the designer.